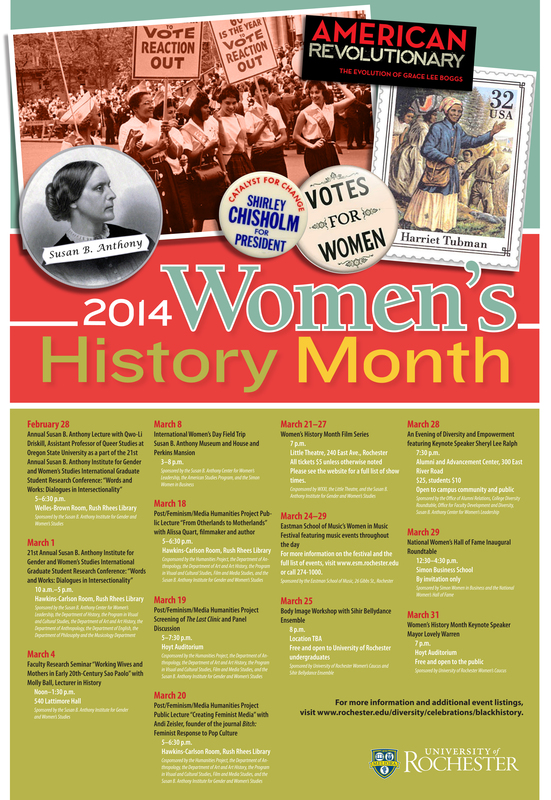 Women’s History Month has arrived! It’s only the 5th of March and we are already well into our celebration of Women’s History Month! If Friday’s Susan B. Anthony Keynote Lecture, Saturday’s Graduate Research Conference, and Tuesday’s Faculty Research Seminar are any indication of how the rest of the events in March will be, then we are in for a great month. We are especially excited for the upcoming Post/Feminism/Media Humanities Project as well as our collaboration with The Little Theater and WXXI for our annual Women’s History Month Film Series. Check in soon as we’ll be sharing posts about these events in the near future. Take a look at this poster to see the University of Rochester’s WHM events and details. We hope you’ll celebrate with us!